Installed on the carriage, respect and discretion are best assets to share the intimacy of wildlife that occupies the site. Pulled by draft horses, the carriage follows a path traced on dykes of old fish farms and overlooks the marsh, at the heart of the National Nature Reserve. During this journey, the guide will explain you all about the natural heritage and the management of the Vigueirat Marshes and ecosystems of the Camargue, its water management, agricultural activities and local traditions. Besides the diversity of characteristic species : ducks, geese, herons, flamingos, storks and wading birds, you can also watch the herds of Camagrue horses and bulls grazing on the field. Also on the site : coypu, wild boars, foxes and even snakes do not hesitate to make an appearance. 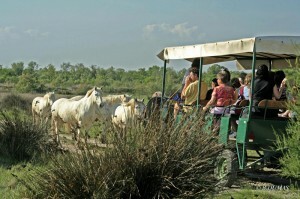 Along the dykes that criss cross the marshes, discover to the rhythm of draft horses the highlands of the reserve on which graze about 25 mares and 50 Camargue bulls and cows from the herd of the Judge. The cows begin to calve, and you can observe the newborns’s behaviour resting and playing near their mother. Another highlight of the visit is the couples of white storks who return to rehabilitate their nest. Ten couples are currently present. The youngs born on the site will then be ringed in order to track their migration to Africa. This tour is offered in March and April. 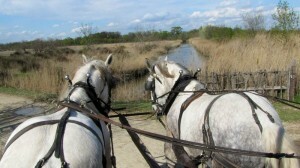 During this period, the horse-drawn carriage does not go inside the area classified National Nature Reserve to allow nesting birds (including herons) to reproduce in a calm and quiet environment. 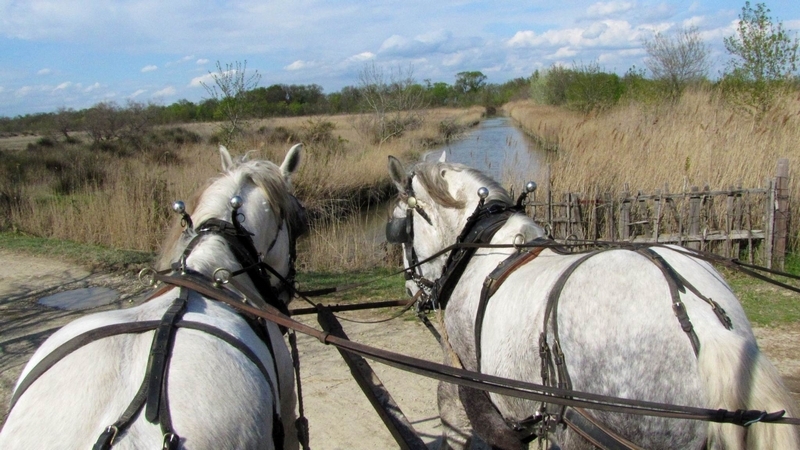 Starting in May, the carriage will go again on the dykes that criss cross the marsh, giving stunning views of marshes, reed beds and salt marshes. Whatever the season, the visit in a horse-drawn carriage propose a stop at the bats’s Museum. 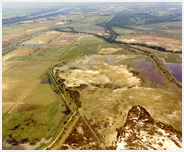 Visitors must report to the reception of the Vigueirat Marshes 15 minutes in advance to register. To safeguard the good running of our business, we can not accept visitors late. No delay will therefore be tolerated, and no refund will be made by the organizer.